I am thankful that when it comes to television, Mr. J and I don’t have a problem as far as what shows to watch. We like almost the same programs – I watch what he watches, and he likes to watch what I watch. My only problem with him is when he’s got the remote control – he changes channels so much I get dizzy! He loves to scan the channels, and when commercial break comes, his fingers get busy with the remote almost like an instict. He can’t just stay in one channel. He just has to look around. I know though, that this is a habit not unique to Mr. J alone. This is a guy thing. It must have something to do with the nature of men.. their nature to explore and conquer? Anyhow, we were watching Tyler Florence over in FoodNetwork on Saturday afternoon. We just got intrigued with these cheesy pancakes. Coupled with the prosciutto and the apples.. this breakfast looked like a winner. “Hmmnn… Why don’t we try that?” Mr. J. said. “But you don’t like cheese”, I said to him. Mr. J always teases me because I love cheese a lot. He smiled and said, “well, it’s ricotta. I’m willing to try it”. So that settled it. I have no problem trying Tyler’s ultimate pancakes. So that very day I went to the grocery and picked up what we needed. Mr. J didn’t expect for us to have the pancakes that very next day,so he was a bit surprised. Since it’s Sunday, I thought it was a good time. So, why wait? This breakfast then is a collaborative effort between Mr. J and I. I love it when we cook together. I made the pancake batter, but Mr. J took care of the flipping, and cooking. The prosciutto and apple wasn’t much of a problem because both gets thrown in the oven. So just be patient, because you’re going to be rewarded with a very delicious breakfast.. heavy and rich, but delicious. This breakfast sustained us, so much so that we didn’t get hungry until dinner! 2. Lay the slices of prosciutto out in a single flat layer. Season with some salt and freshly ground black pepper, if desired, and pop into the oven. Roast the prosciutto until crispy, about 10 to 15 minutes. 3.Cut each apple into thirds, remove the cheeks and discard the core. Slice each piece into 4 and toss with butter and maple syrup. 4. Transfer to a roasting pan and place in the oven. Roast the apples until they are fork-tender and slightly caramelized on the top, about 30 to 45 minutes depending on ripeness of the fruit. 1. Combine the ricotta, egg yolks, buttermilk, lemon juice, and lemon zest in a large mixing bowl. 2. Sift the dry ingredients: flour, sugar, baking powder, and salt together into the ricotta mixture and stir until fully combined. 3. In a separate bowl whisk the egg whites until stiff peaks form and then gently fold into the batter. 4. Heat a large nonstick pan over medium heat and add a little butter. 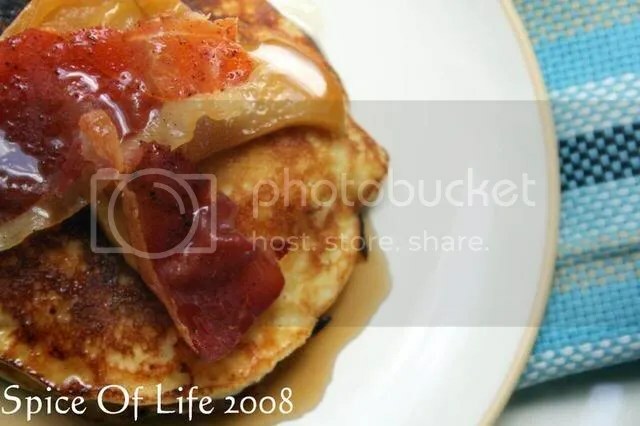 Cook pancakes at a time using a 6-ounce ladle or measuring cup to pour the batter into the pan. 5. Cook the pancakes on 1 side until they set. When small bubbles appear on the uncooked surface, flip the pancakes and cook until golden on both sides, about 6 minutes (or longer). Keep the pancakes on a plate set at the back of the stove under a dry towel to keep warm while you make the rest. 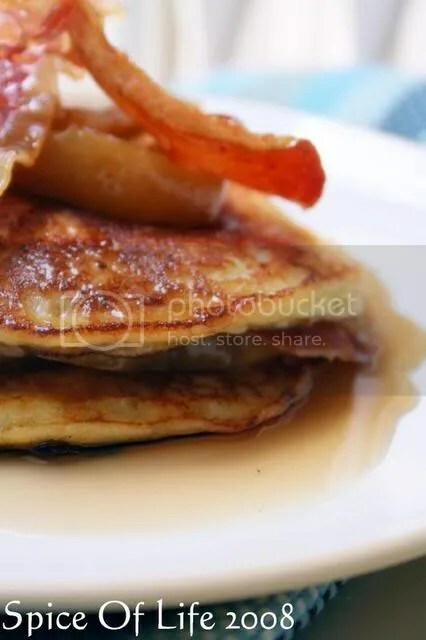 To serve, lay the pancakes on a plate and dust with confectioners’ sugar. Serve with roasted apples, crispy prosciutto strips and warm maple syrup. Which is why I’m drooling over your pancakes right now. They look fabulous! whoa…i love sweet + salty or doing salty things to thing which are normally sweet vice versa…so, i love this creation! It is always a danger for me to watch Tyler Florence. One, I think he’s so hot 🙂 and two, he always makes me want to go into the kitchen and make something. I’ve tried many of recipes and loved them. These look so delicious. And it’s always wonderful to see breakfast pancakes with savory flavors. Grown up pancakes! Yum. That looks absolutely divine! I love your blog and gave you the Tree of Happiness award. Please check out my website for more details. Just about time for apple season. 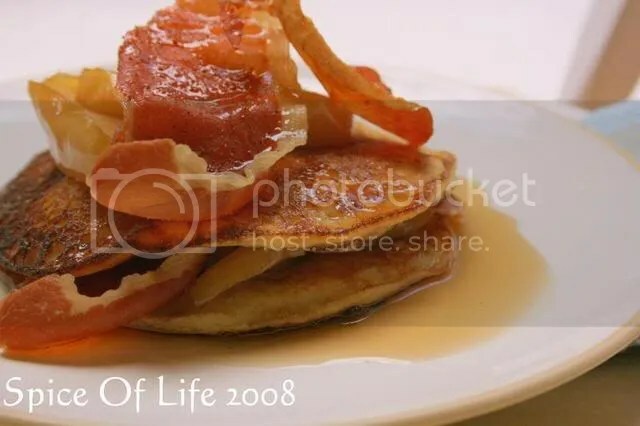 Very nice twist on a pancake! Stop by my blog when you get a chance. Tag. You’re it.